This is definitely the longest time between reviews in one section on Beer O'Clock Australia. This hasn't been neglected, it's more an availability thing with very few of the Munich brewers sending their Oktoberfest offerings out our way. Anyway, over three years is far too long no matter the reason. Augustiner beers are rarely found outside Munich, let alone Germany. In recent times some of the Edelstoff and the Maximator have been making it to the U.S. and I assume some was probably imported from there. Augustiner-Bräu produces around 100 million litres of beer a year, and is the only brewery still serving it's Oktoberfest beers from the traditional wooden barrels at the festival. The beer pours a quite a light colour for a lager, with the body being quite a light yellow/golden colour. The head is small and has disappointing retention. Thankfully there is some lacing, but otherwise it's quite a disappointing pour for quite a highly rated lager. I suppose that in the Oktoberfest beer market, a beer with a long lasting head is probably a little bit of a draw back - you want as little head as possible when hefting a Maß. Onto the nose and it was relatively light and definitely inoffensive. The malts were bready and seemed to drive the beers aroma, which seemed a little sweet. There was also some nice floral hop characteristics coming through, although they were quite muted, and bitterness seemed restrained. My overall impression of the nose was that it was quite nice, there just wasn't quite enough of it! Thankfully the beer tasted better than the appearance and aroma led us to believe it would be. It was a nice crisp lager with good bready malts up front, which had a sweetness to them but weren't unpleasantly so. The hops were both grassy and floral and provided nice flavour, although very little bitterness was imparted. 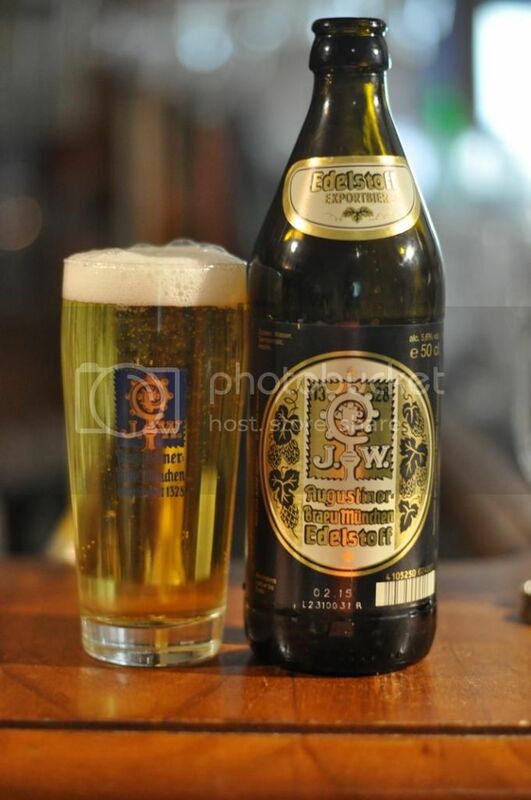 Augustiner Edelstoff finishes nice and dry and leaves you wanting more beer! In summation, I think this beer would be perfect for Oktoberfest. It's a good example of the sort of thing you could drink all day, whether you're a craft beer lover or a regular macro lager drinker. While I feel it would be exceptionally quaffable; that doesn't automatically make it a good beer though... There's definitely other lagers I would drink ahead of this, although I'm quite happy to check it off my list.